I’m so excited about this week’s card – I got to use one of my newest stamp sets! This sketch just called out to me – I hope it does to you, too, so you’ll join the fun. I knew right away what I wanted to do, and the set I wanted to use. This was a bonus, because inspiration doesn’t always come that easy! I started with a card base of Night of Navy cardstock, then layered a panel of English Garden Designer Series Paper on top. I cut another strip of Night of Navy cardstock, and stamped it with the dots from the Watercolour Wings stamp set, in Night of Navy ink. I attached it to the left side of the card base, and added 3 Candy Dots in Melon Mambo. To make the flower panel, I took a piece of Whisper White cardstock, and stamped the flower outline images from the Garden in Bloom stamp set in Night of Navy ink. I then inked up the inner colour stamp with Lost Lagoon ink, stamped it off once, then stamped the inside of the flower. The leaf outlines were stamped in Mossy Meadow and the centres stamped in Pear Pizzazz; the butterfly and bee outlines stamped in Memento Tuxedo Black ink. The inner stamp for the butterfly was stamped in Melon Mambo, and the inner part of the bee stamped in Daffodil Delight, as were the flower centers. When I finished stamping this panel, I layered it onto another panel of Night of Navy cardstock, and attached it to the card front. I then stamped the butterfly using the smaller butterfly from the Watercolour Wings stamp set; I inked up the outside layer with Night of Navy, then the inside shading with Melon Mambo. I then die-cut the butterfly using the Big Shot and the Bold Butterfly Framelits. 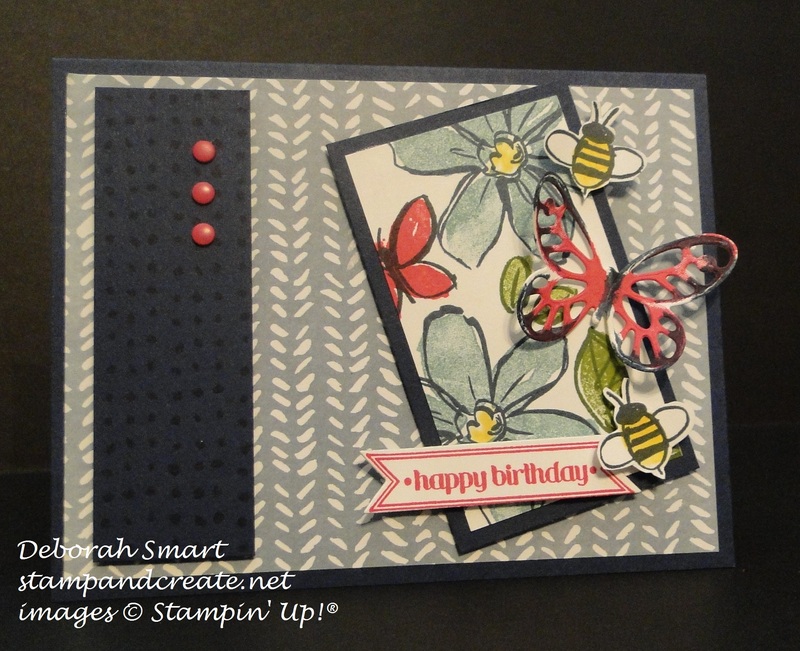 I then copied the layout on the sketch, and placed the butterfly & bees down the right side of the stamped panel. To finish off the card, I stamped the sentiment from the retired Bitty Banners stamp set in Melon Mambo ink, and die cut it using the Itty Bitty Banners Framelits, then tucked it in next to the bottom bee, using Stampin’ Dimensionals. 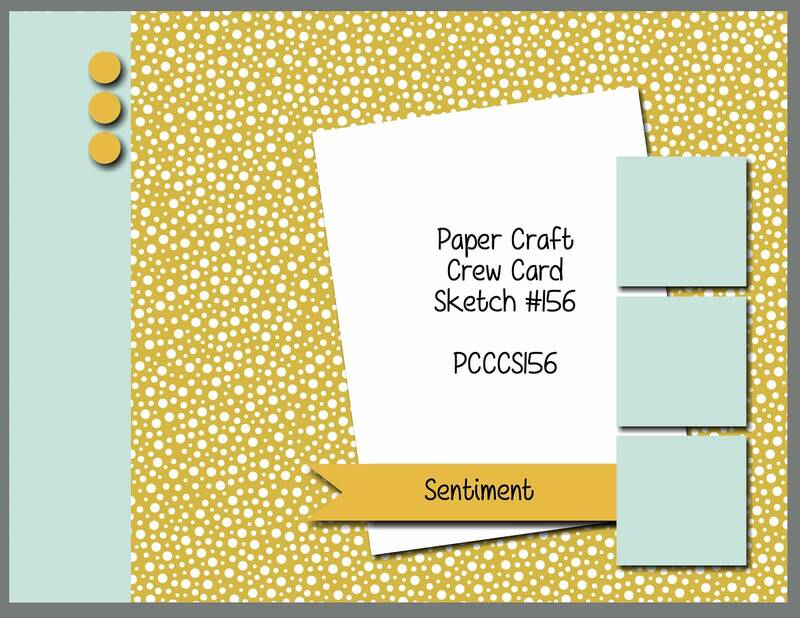 Head over to the Paper Craft Crew page – I’ll see you there! Previous Previous post: Weekly Deals & New Catalogue Excitement! Next Next post: Pop-Up Card – A New Technique! 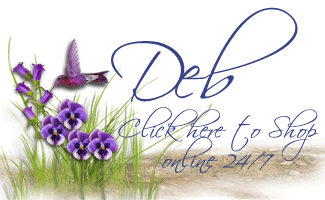 This is beautiful, Deborah! I can see why you’re thrilled. I love it!